Cider Australia has launched a world-first trust mark for Australian cider producers, which will help consumers identify ciders which are made with 100 per cent Australian fruit. The move has come as a result of Cider Australia working with Wine Australia to develop strategies to help market and grow exports of Australian craft cider. The two associations have worked together on the trust mark and overall brand proposition after receiving a $500,000 boost from the Australian Government’s $50m Export and Regional Wine Support Package. 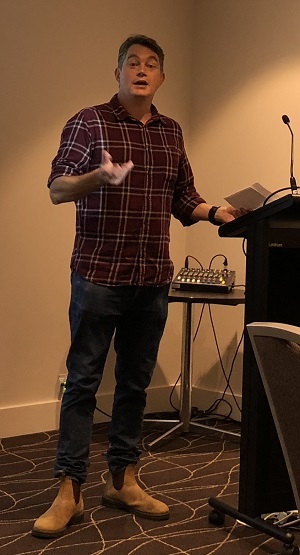 Speaking at the launch this morning, Sam Reid, president of Cider Australia, (pictured below speaking at the launch which took place on Friday 5 October) said the trust mark was part of the overall strategy around developing the cider category both domestically as well as overseas. “Cider Australia is set up to help the whole cider industry and this has been driven by a need from our members to differentiate. Our stated objective is to build the category and premiumise the category and this we felt this was a strong platform for helping to do that. “This will help get our message out globally, it will help our members with exporting but it will also have a lot of benefit for the local market as well. “I’m incredibly proud that we are the first country to develop a cider trust mark. “Authenticity is very important to our industry. The trust mark will help consumers to recognise what makes Australian craft ciders unique – a premium beverage made with 100 per cent Australian grown apples or pears. “This initiative also aims to drive significant growth for the Australian craft cider community, raising its profile both domestically and internationally. In explaining the thinking behind the design, Reid said that the hand, has connections to the hand crafted nature of cider and with so many producers currently featuring trees and/or apples on their labels already Cider Australia wanted something that would stand out more. Guy Taylor who consulted on the project with Cider Australia added: “The resonance of it will be different in national markets is going to be different to international markets. In an international sense it speaks to ‘Australian-ness’ and a human involvement, a crafted involvement and a bespoke involvement, more so than anything else. Cider Australia said that domestically the trust mark will also raise awareness among consumers that they are supporting Australian fruit growers, boosting Australian jobs in the craft cider making industry and helping regional communities in the process. Cider Australia estimates that approximately 30 per cent of drinkers will choose to drink a premium cider made with 100 per cent Australian-grown fruit if they have the choice and can identify these ciders. The launch this morning also discussed how Cider Australia plans to audit and monitor the trust mark in order to protect its integrity. And while some of the finer details are yet to be finalised essentially the trust mark will only be available to Cider Australia members to ensure the cider produced meets an industry standard, while providing complete integrity within the market. Reid also told TheShout that the mark will be registered with the ACCC, so any brands seen using the trust mark without authorisation will come under scrutiny from the consumer watchdog. Consumers will start to see the trust mark on eligible craft ciders in retail outlets starting from November this year, rolling out more widely over summer.